Shirts With Random Triangles: Report: South Florida And Western Kentucky To Play In Miami Beach Bowl. Report: South Florida And Western Kentucky To Play In Miami Beach Bowl. Miami Marlins Park. Image via CBSSports.com. It looks as though South Florida and Western Kentucky already has their bowl plans in place. The two teams have reportedly accepted bids for the Miami Beach Bowl. 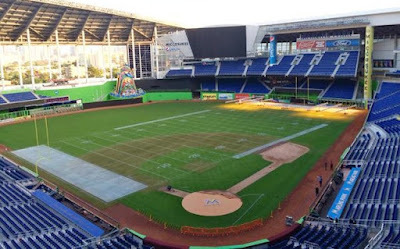 Brent McMurphy, citing sources, reported that the Bulls will accept an invitation to the second-annual Miami Beach Bowl, to be held on Dec. 21. in Miami, Fl. Mike Organ reported on Twitter that WKU had also accepted a Miami Beach Bowl bid. The Miami Beach Bowl, now in its second year, pits an American Athletic Conference team against a Conference USA team. It will be played Dec. 21 at Marlins Park in Miami, Fl.